There are three things that I think of when I think of Easter – the Easter bunny, Easter egg hunts, and carrot cake. 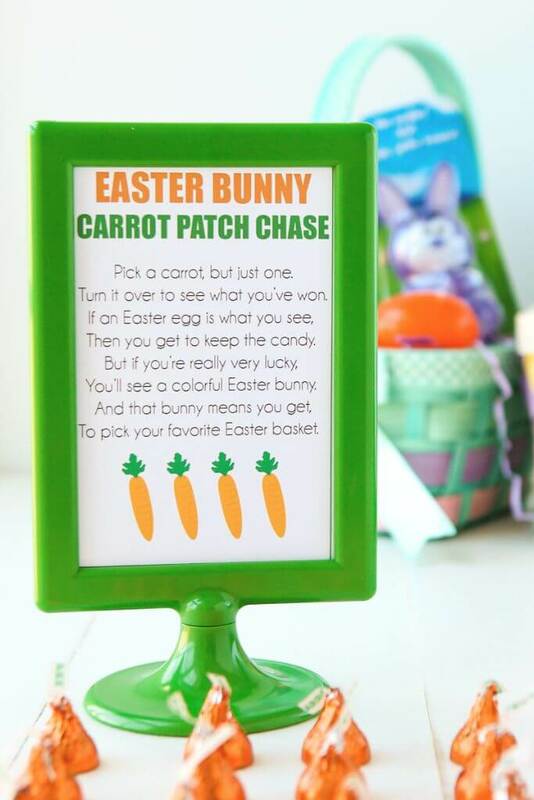 These three printable Easter games for kids incorporate all three! This was originally written as a sponsored post for Hershey. All opinions and ideas are 100% honest and my own! Post also contains affiliate links. Once upon a time I watched an episode of Amazing Race where the contestants were forced to knock down sand castles to try and find a clue buried underneath one of the hundreds of sand castles built on the beach. 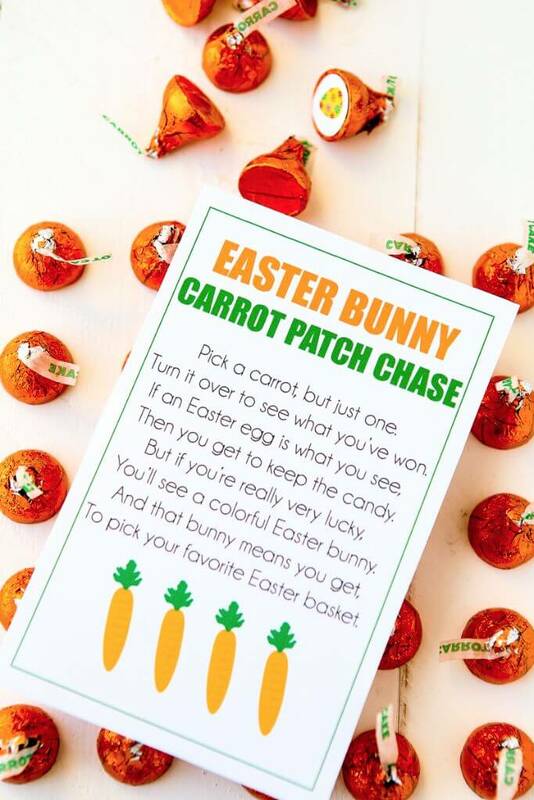 I used this idea to create three Easter games for kids that incorporate this same idea – picking a random option from a bunch of different options to try and pick the lucky one. 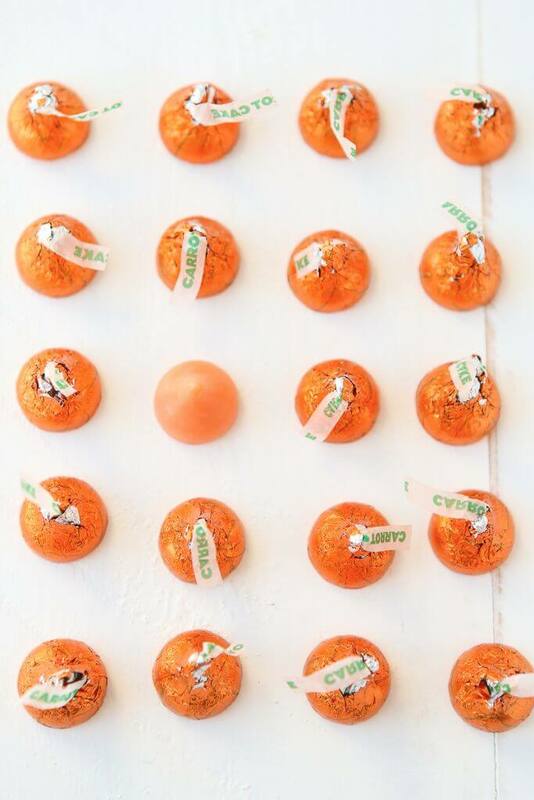 All of the games start the same way, by setting up a candy carrot patch full of the new Hershey’s Kisses Carrot Cake Candies, which are so yummy and they’re orange, so it actually looks like a carrot patch! 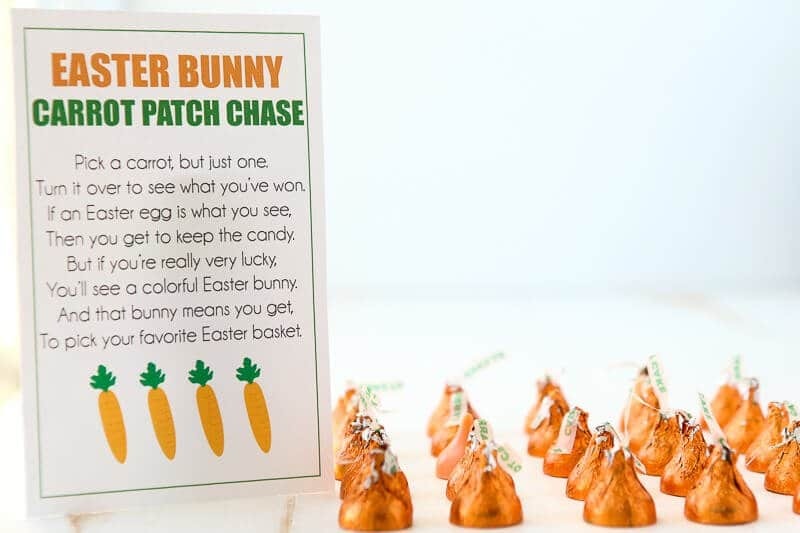 This is about more than just a carrot patch full of kisses. 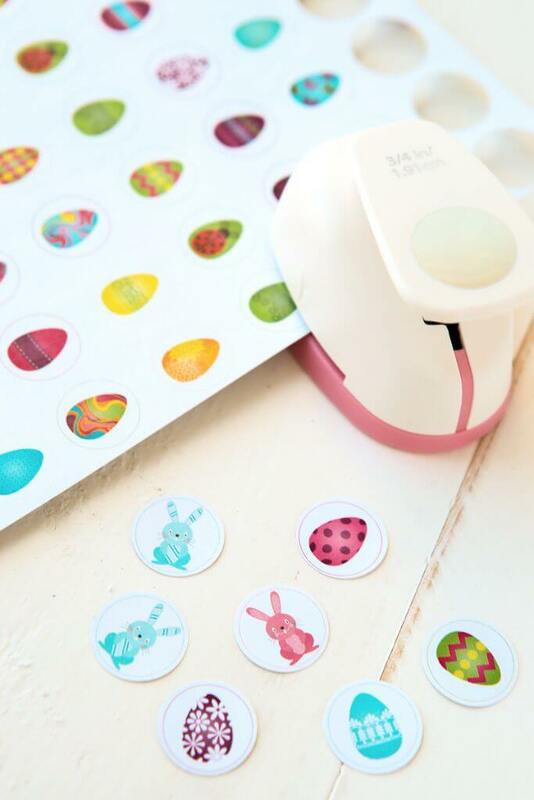 Before you create the carrot patch, print the cute Easter stickers you can get in the free downloadable file at the bottom of this post. My recommendations for printing are in the download the free printable file section! 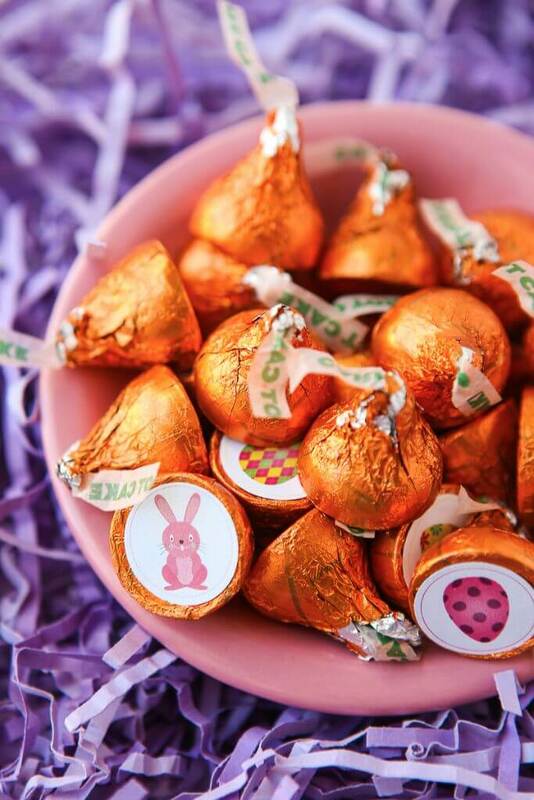 Print out the stickers and add one to the bottom of each of the kisses. Each of the games uses the stickers differently so read the individual instructions carefully! That’s all you need to do start. You can choose which of the three to play based on the game descriptions below. I’ve included who each would be best for to help you out but you know your guests better than I do, so just pick whichever sounds like more fun to you. 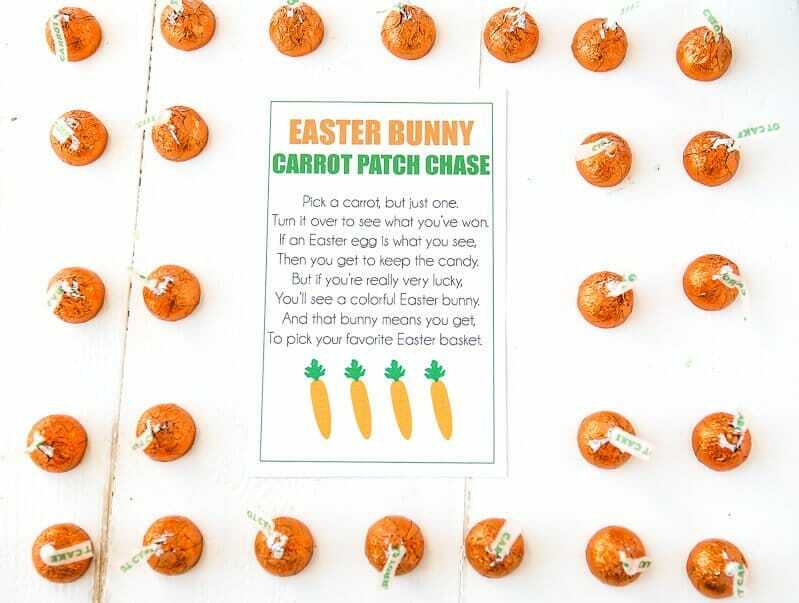 Along with the instructions, I’ve also included free printable signs/instruction cards that you can download and print to set along with your carrot patch if you’re playing at a class party or something. 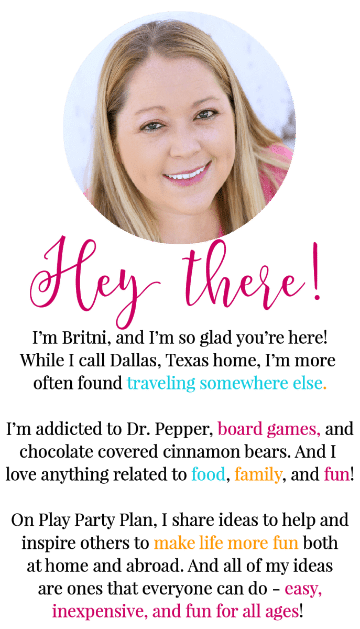 Get those free printables and the stickers in the download the free printable file below section. As I mentioned, you can totally play these with teens or adults as well! I’ve included details with each of the games below on how best to do that. 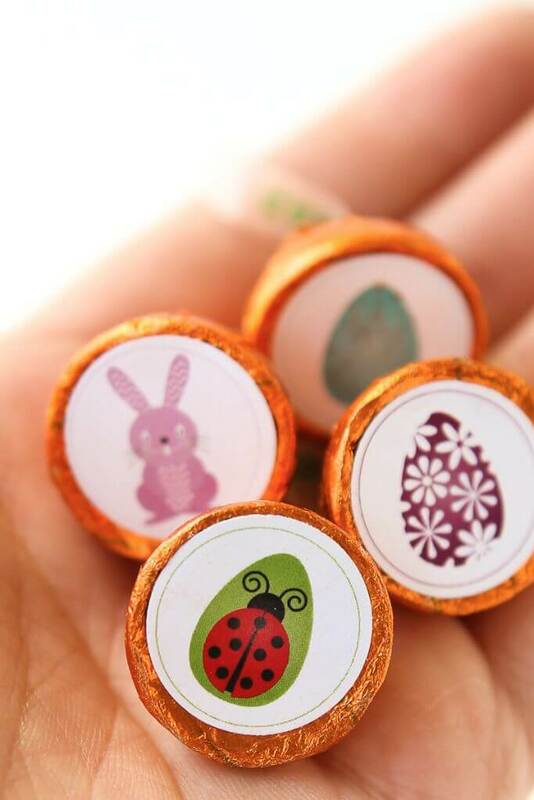 Goal: The goal of this game is to choose the candy that has an Easter bunny on the bottom. 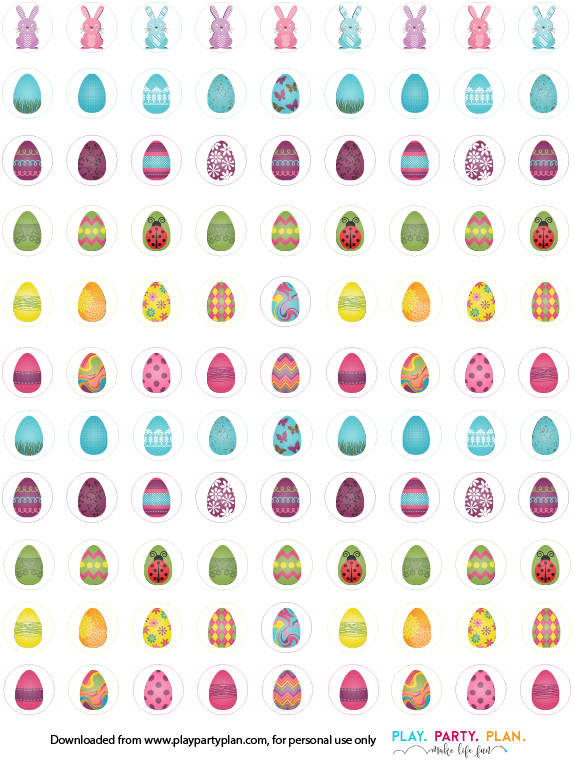 I purposely made a lot more eggs than Easter bunnies in the printable sticker set and this game is why. Setup the carrot patch with lines of candies with the stickers facing down. Players get to choose one Hershey’s Kisses one at a time. If they get an Easter egg on the bottom, they get to eat the candy and go to the back of the line. 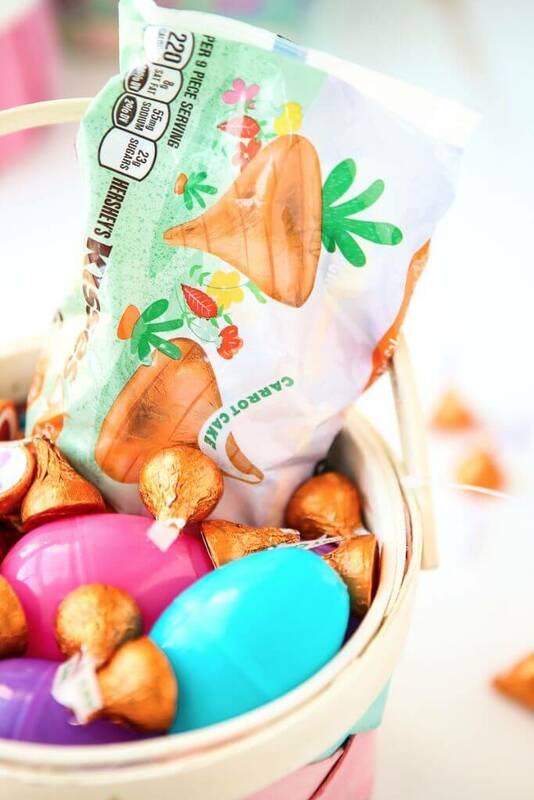 If they find one of the coveted Easter bunnies, they win an Easter basket filled with your favorite Hershey’s Easter candy and plastic eggs filled with surprises! Or get one of these already made Easter baskets! Keep playing until all of the Easter baskets are given out. 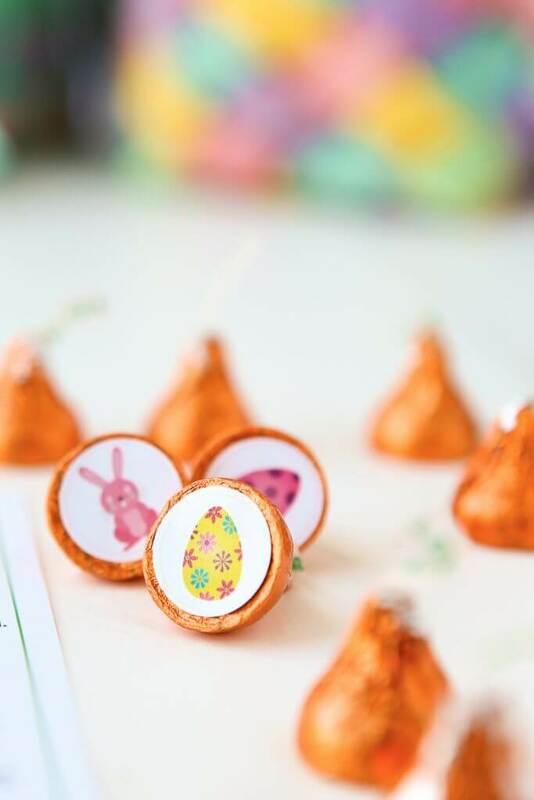 Prize Ideas: Small Easter basket filled with Hershey’s candies, Easter stickers, Easter activities, etc. Goal: There really isn’t a goal for this game, it’s more like the pick a duck game where everyone wins. 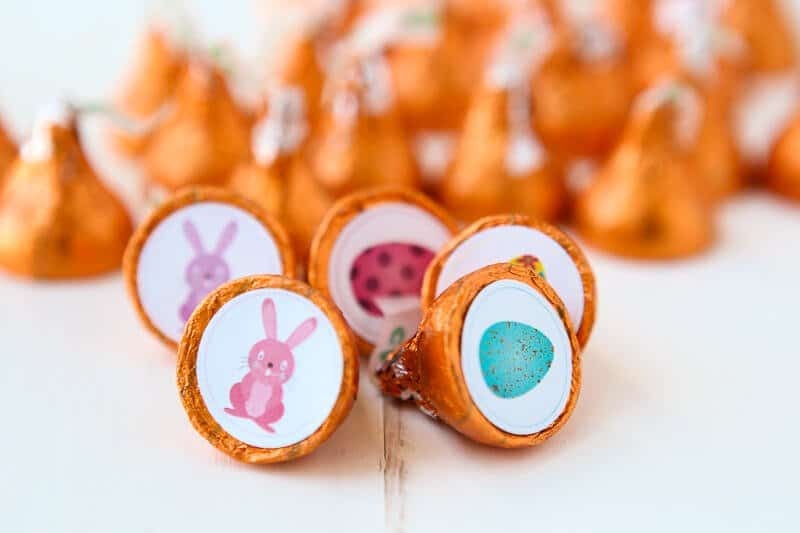 Players get to choose one Hershey’s Kisses Carrot Cake Candies to turn over and they win the prize associated with the ring around the bunny or egg on the bottom. The one caveat with this game is that you need to make a key that designates what type of prizes they get. 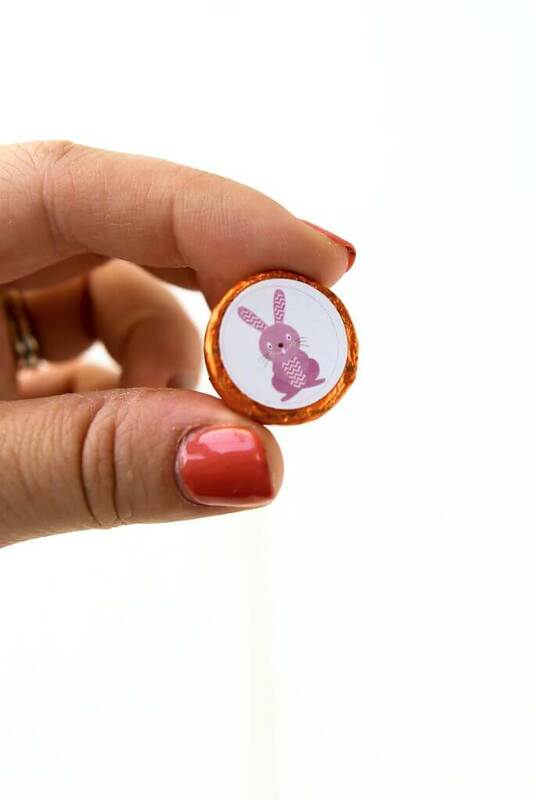 For instance, if they get a sticker with a purple rim – they win an Easter egg filled with treats. If they choose an egg with a blue rim – they get a coloring book. And so on. 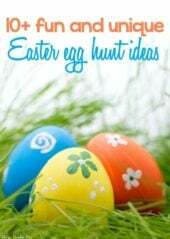 Prize Ideas: Silly putty, Easter egg filled with Hershey’s candies, an Easter sticker, etc. Goal: Match pictures on the bottom of the Hershey’s Kisses Carrot Cake Candies to each other. Player gets to choose two Hershey’s Kisses to turn over. If they are the same picture, the player wins a small prize. If they are not, it’s the next player’s turn to try. Like any other matching game, players can watch other players to get clues to where the matches might be. Keep taking turns choosing kisses until everyone gets at least one match and wins a prize. 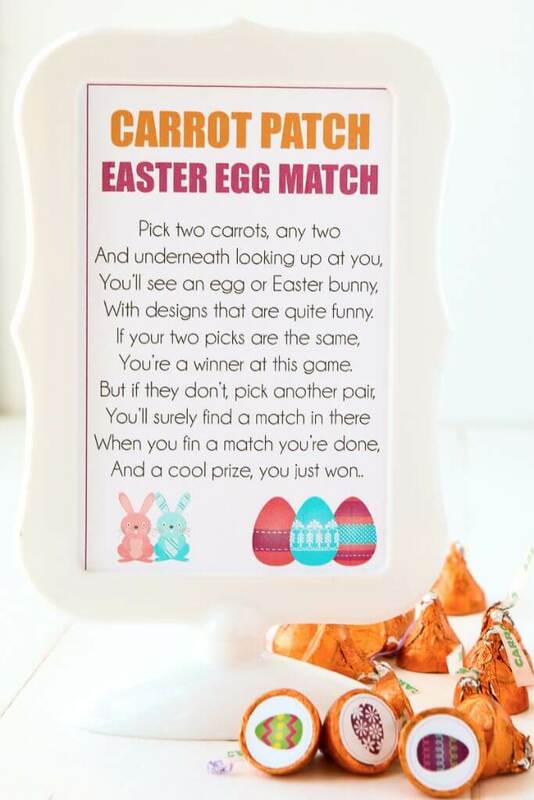 Or you could play it like this traditional Easter memory game and see who can get the most matches! Best for: Elementary school kids or older who will be able to find matches. This would also be a great game for playing with your preschooler or elementary school child at home where they are trying to get all of the matches to “win,” no prizes necessary. 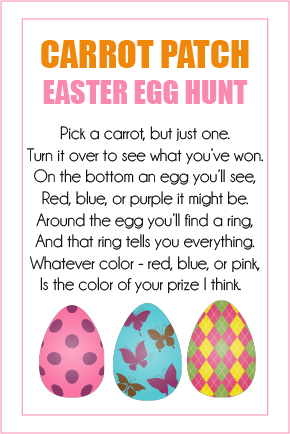 Prize Ideas: Silly putty, Easter egg filled with Hershey’s candies, bracelets, stickers, etc. 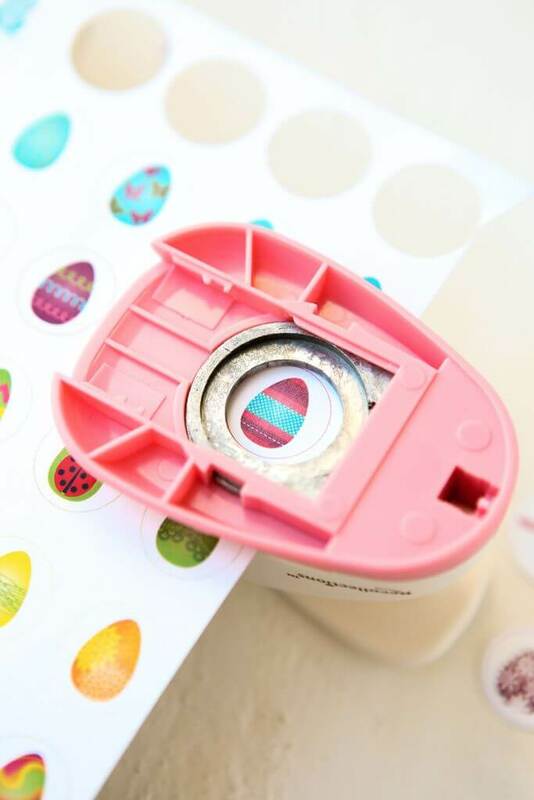 Enter your first name and email address in the form below to get the free printable Easter stickers and game cards. If you do not see the form, click here to get to it. To print the stickers, I recommend printing them on full sheet labels (like these ones) and punching them out with a 3/4 inch circle punch (I love this one because you can actually see it when you’re punching the paper). Then stick each of the stickers on the bottom of your Hershey’s Kisses. And voila, you’re done! Don’t just stop there! 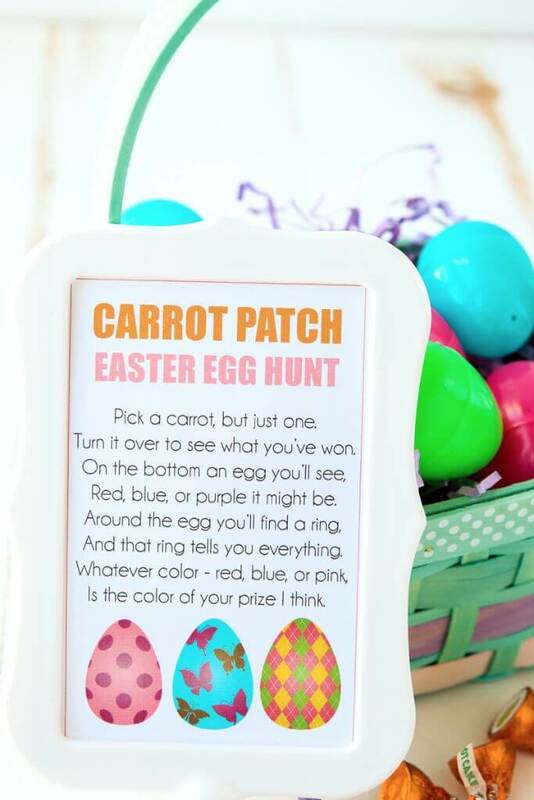 I’ve got tons of great Easter games for kids! I think even adults will have fun playing these games. 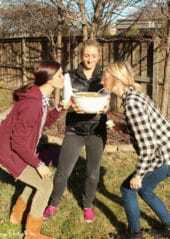 Friendly competitions such as amazing race and egg hunts are thrilling! They are great also for team building events to break the ice and make friends with others. I had no idea that they made carrot cake kisses like this before! I love when companies improve and change up flavors like this. 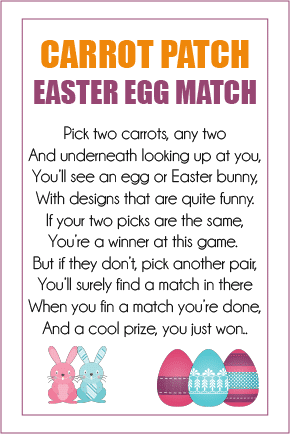 I love the Easter match game how much fun for kids. Those are some awesome games! I know I would have loved them as a kid, which means that my niece will love them now! She’s almost 3 and its such a fun age for introducing these kinds of new traditions too! I can’t wait to see her reaction! Wow! Carrot cake Kisses??? I’m definitely getting bags of those! Love that! And I love the games you posted! So creative and fun! 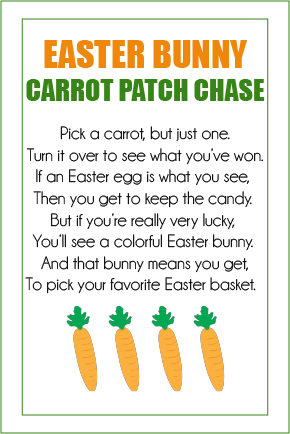 Might just use the carrot patch game too! Thanks for sharing! Omg my nanny kids would love this game. This is so much fun. I love how creative you are and you got this idea from Amazing Race. How awesome. Definitely printing this out for them! They will love it. 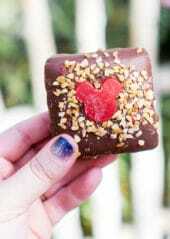 Those look amazing!!! I’m not a kid anymore but I’d LOVE to join these kinds of games 😉 haha. I’m seriously wanting those carrot cake kisses. Very intriguing!